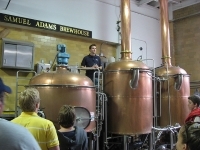 Visitors to Boston can take an informative tour of the Sam Adams Brewery and get a look at the brewing process for the popular beer. Named for the revolutionary war hero, the beer has been brewed in Boston since the 1980s. The tour showcases the entire process and allows visitors to taste the special malts used. Tours depart roughly every 45 minutes and last about one hour, with a free glass included for visitors using the Go Boston Card. The brewery does not accept reservations, but they do recommend that visitors arrive fairly early in the day to avoid long waits, especially on Saturdays. All donations benefit local charities. Opening times: Monday to Thursday 10am - 3pm, Fridays 10am to 5.30pm, Saturdays 10am to 3pm, closed Sundays.